The Modern Language Association (MLA) updates its recommendations for how to format an essay every so many years. The most recent MLA essay format guidelines were published in the MLA Handbook, 8th Edition, available here. It consists of a basic set of principles, rather than rules, that allows for some flexibility in terms of how a student cites and references sources. The key concepts of MLA formatting are also available in this nifty and easy to use infograph from Purdue OWL. The main points to remember when formatting a paper are to be consistent, to adhere to the fundamentals, and to provide as much relevant info as possible. In this article, we’ll examine how to write a paper following the concepts put forward by the MLA. We’ll give you some examples along the way too. The current MLA essay format is fairly straight forward and easy to follow. Let’s look at the basic format for this type of paper. MLA essays should be type-written on standard white paper, 8.5 x 11”. In the first row of the upper left-hand corner of the first page is where you would place your name. Below that should go the name of your instructor. Below that should come the name of the course. And on the fourth double-spaced line below that should be the date. Then comes the title, which should be centered. See here for how to create great essay titles. The title should not be bolded, underlined or placed in quotation marks. The header will consist of the page number and your last name (name followed by page number) and be situated in the upper right-hand corner in the margin (½” from the top of the page). Here is an example of how your first page should look. Notice there is no separate title page for an MLA style document. 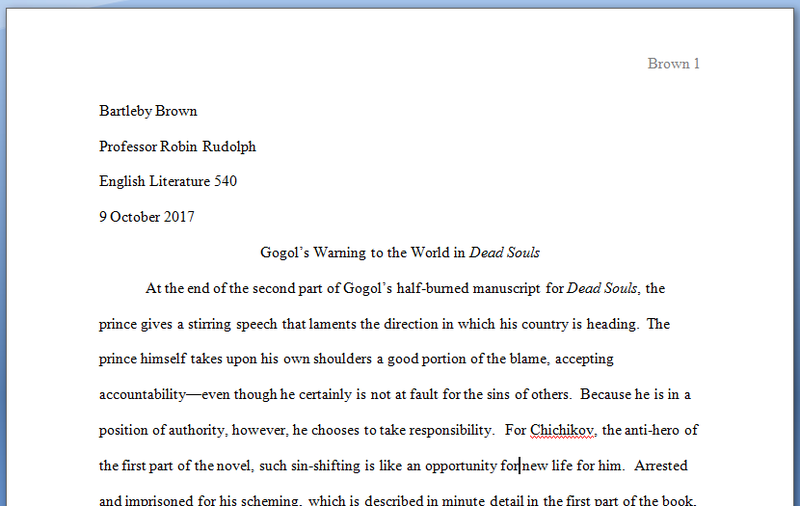 Also, notice that the title of essay contains an italicized set of words: this is because this set of words is the title of a novel by Gogol. If you incorporate the title of a novel or other published book in your title, it should be italicized. If you include the title of a short story in your essay title, that short story should be contained in quotation marks. Notice too that the double-space format of the document is consistent and does not change throughout. All lines remain double-spaced, and there are no extra spaces placed between the title of the document and the introduction of the essay. Every line is equally spaced from its neighbours. The first line of the essay should be indented (as should all subsequent new paragraphs) five spaces or ½”. If you are using Word to type your paper, the spacing configurations should already be set by default to adhere to these settings. Section headings can be used to break up the paper into parts. This can be an especially useful organizational method for longer papers as it helps the reader to see how the essay is laid out. Section headings can be formatted or unformatted. They can be numbered (1, 2, 3…etc.) or not. There is no defined rule for section headings. However, whatever method you do employ, be sure to carry this method throughout the whole of the paper. 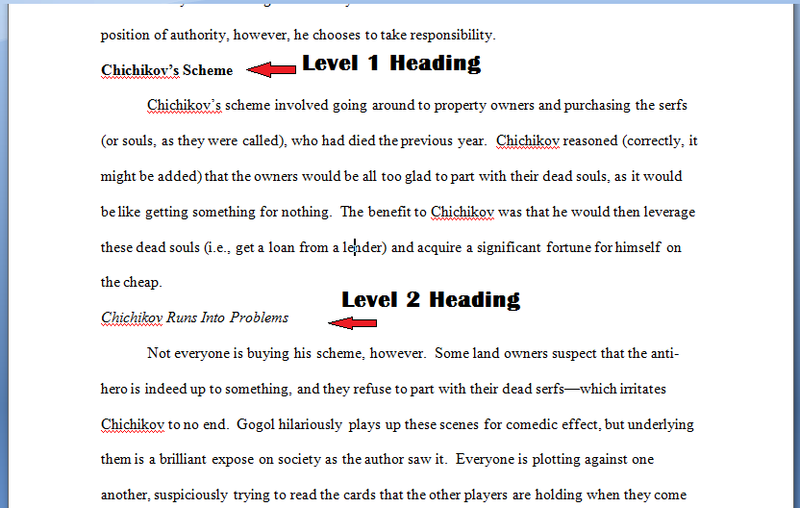 If you start off numbering section headings, be sure to do so all the way through the essay. If you don’t use numbers, consider formatting the headings so that section headings and sub-headings stand out uniquely one from the other. So, for example, the first main section heading you use would be LEVEL 1. If there is a sub-heading within this section, it would be LEVEL 2. If there is a sub-section within this sub-section, it would be LEVEL 3, and so on. Once you arrive at the next main section, you would use another LEVEL1 heading to start it off. Sometimes you’ll want to use a longer quote from your source material in your essay. If the quote is four or more lines, turn it into a block quote. A block quote is set off from the paragraph in which it is placed. The entire quote is indented and, like the rest of the paper, double-spaced. The page number and name of the author (if not stated previously to indicate from where the quotation is taken) is included at the end of the quote. Here is an example of a block quote used in an MLA essay. In-text citations for direct quotes should appear like the one in the example above: (Gogol 27)—i.e., the author’s last name followed by the page number. If a direct quote is not used but rather information is summarized, an in-text citation should still be applied, but in this case no page number is needed—just the author’s last name. If the author’s name is stated in the actual sentence, then this will count as a citation and no parenthetical citation need be applied. For more information on how to cite sources using MLA style, check out these articles: How to Cite a Website Using MLA and How to Write an Annotated Bibliography. When a work is cited in the essay, it must be referenced at the end of the document on the last page. This page is entitled the Works Cited page. The basic format for a reference is: author’s name followed by title of work and publication data. Doe, Jane. Night of the Caller. Penguin, 2007. 1930s.” Journal of Worker’s Rights, vol. 23, no. 4, 2003, pp. 9-23. Web sources can also be used—and in today’s day and age a lot of material used in writing papers may come from websites. Aug. 2017, www.zerohedge.com/news/2017-08-29/bank-america-could-get-ugly-we-think. Accessed 9 Oct. 2017. Notice that the URL is abbreviated by excluding the http:// at the beginning of the web address. However, date of publication is still included as is a date that the source was accessed. This helps readers know when the site was last used by the writer in case the site is no longer available for viewing. When you go to write your essay, be sure to know what the guidelines and recommended practices are for the format and citation style you’re required to use. Professors and teachers will typically let their students know which formatting method to abide by when they go to write their essays. However, if this is not made clear, always ask. MLA style is one of the most common formatting methods used by writers. This method has changed over time and is sure to be refined again in the coming years. So always check with MLA to see the latest updated version of the Association’s guidelines for formatting. No title page! 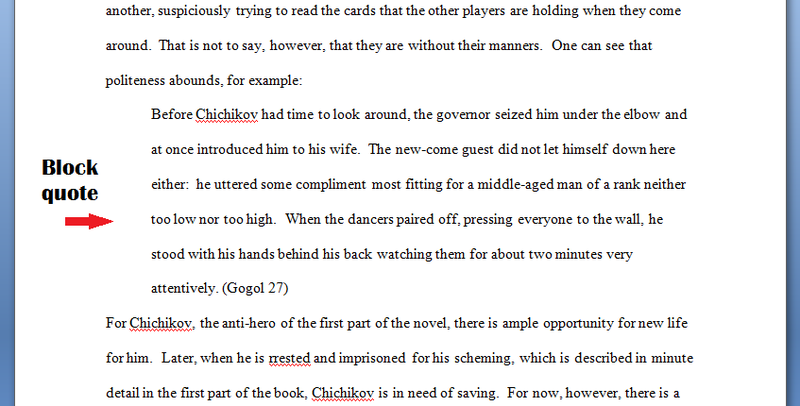 Everything is placed on the front page of the essay (see the example above). Section headings may be done however you like—just be consistent. A running header will include your last name followed by the page number of the document. In-text citations are simple and straightforward, usually consisting of the author’s last name followed by a line or page number. If the author’s name is already given in the sentence, there is no need to include it parenthetically. Likewise, if there is no direct quote, there is no need to include a line or page number. The references page will be called the “Works Cited” page and will include a list in alphabetical order of all the sources you referenced in your document. "How to Write a Paper in MLA Essay Format." Aceyourpaper.com. Student Network Resources Inc, 13 October. 2017. Web. 20 April 2019. 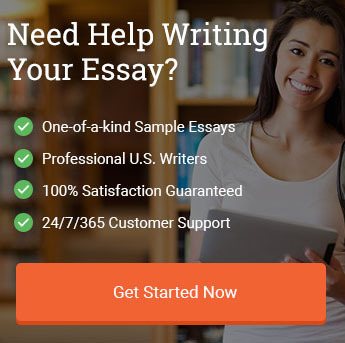 Student Network Resources Inc. "How to Write a Paper in MLA Essay Format." Aceyourpaper.com. 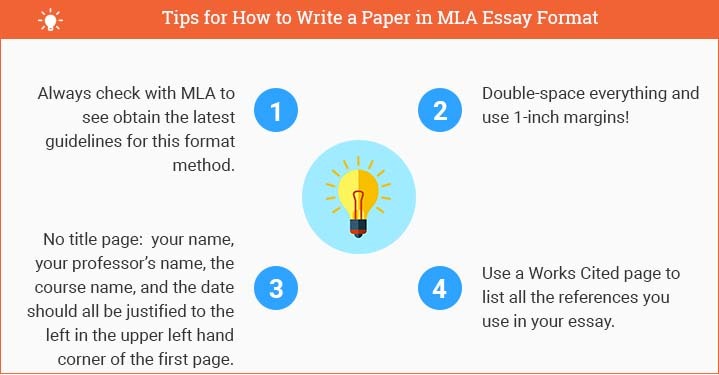 https://www.aceyourpaper.com/citation-guides/mla/mla-essay-format/ (accessed April 20, 2019).